Nothing screams St. Patrick’s Day more than your very own customized bottle opener. You can put your very own 3D lenticular image on the front to promote your company or to display the fact that you like to party. Its chic smooth style and its oval shape makes it stand out from your conventional bottle openers. 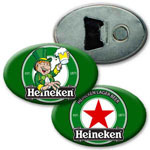 With its magnetic backing, this bottle opener also functions as a refrigerator magnet, allowing it to be in an arm’s reach when grabbing an ice cold beverage.